Ever wonder if your house is outdated? Believe me it is. Even if you just built it. Why am I so certain? We know the energy dilemma in front of us will slap us right in the face if we don’t prepare for it. By 2050 if we don’t change the road we’re currently on, our energy consumption will double. Over that same period of time we will have to also divide our CO2 emissions by a factor of 2 if we want to avoid a worldwide 2°C temperature rise. Housing accounts for 40% of our worldwide energy consumption, and we know the industry can bring competitive solutions that save 30 to 40% of energy consumption. So who is doing anything about this onrushing freight train? As usual, the sins we commit will be what our children inherit. Fortunately, the “kids” are wise to the situation and have taken up arms in the fight to stave off the howling locomotive. By kids, I mean 20,000 collegiate students from around the world who are pushing the envelope on new high efficiency housing designs via a vehicle called the Solar Decathlon. Created in 2002 by the U.S Department of Energy (DoE), the Solar Decathlon takes students from worldwide universities on a 2 year odyssey where they design, build and operate energy-efficient solar-powered houses. Like a World’s Fair, the Solar Decathlon presents the output of its projects (high efficiency houses) to the public. 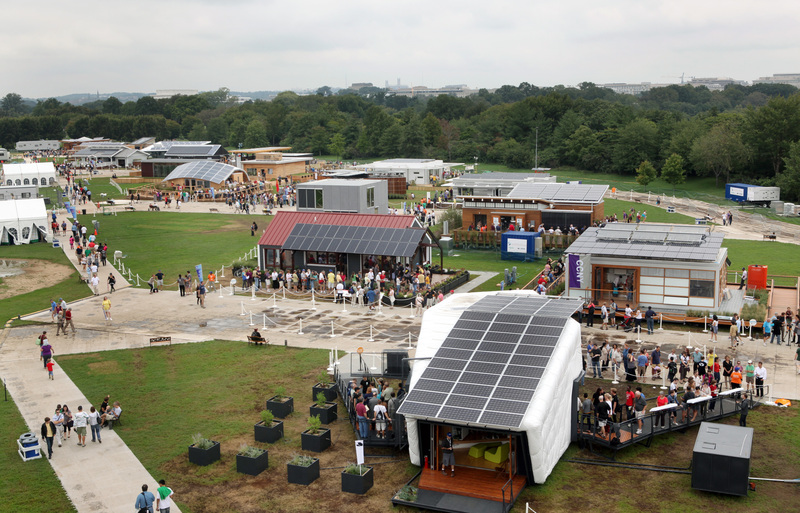 In 2011 in Washington DC (USA), the Solar Decathlon provided more than 350,000 house visits to the public over a 10 day period. In 2012, 200 000 people visited the solar village in Madrid. The projects reflect the students’ ideas on models of homes that meet the challenges of the future. The students’ design parameters account for issues such as urban density, geographic constraints (desert, mountains, water, wind), the integration of renewable energies, and the creation of social bonds. All of the teams are composed of people with multiple skills. For example, they are architecture, town planning, business and engineering students – supervised by professors or researchers – with the support of private enterprises and government agencies (who help fund the projects). The Solar Decathlon projects foster research, establish bridges between universities and industry, and motivate students to work in teams for the betterment of the planet (which means they challenge conventional rules and building codes). So now you can learn more about the benefits, affordability, and availability of clean energy solutions. See what you can learn from a kid and help to shape the foundation for a new energy efficient world. The 2013 Solar Decathlon will be held October 3 – 13, 2013 at the Orange County Great Park in Irvine, California – if you’re around the area, I highly recommend you stop by to check out the most energy efficient homes on the planet! yes you are right Nick, these houses are the most efficient in the world, and at the same time the most sustainable but also pleasant to live in! Therefore also the most “liveable”. As a prove, it’s worth to mention that at each Solar decathlon one or 2 houses are bought by guys who use them as their private house! the same show with competition just happened in Datong/China and I went there and saw top efficient houses from all over the world. The final ranking is reflecting the tremendous progress in western countries but also in new economies with Australia house as nr 1, and then China/Guangzhu house as nr 2 jus before Sweden and Israel houses. Definitely, this is the place to see astonishing houses, where students make the most of solar energy ! After Spain on 2012, China last summer and California this week, innovation, advanced technologies and entrepreneurship will continue their world wide tour in France on 2014. These young talents will face again energy challenge and other sustainable issues during the Solar Decathlon Europe that will be held July 2014 at the “Sun city” / Versailles castle in France. In the mean time, I look forward to seeing the Californian green houses. All the best to all competitors! Hi Michel and Olivier – Thanks for your comments and enthusiasm around the Solar Decathlon!! As you both mention, I’m equally excited to see this competition being deployed all around the world. It’s a fantastic way for students, companies, non-profit organizations and the general public to come together to see how we can take advantage of existing technologies to move towards more sustainable living! This is a great highlight to show the true “international scale” of this event. This is one of the great values of the Solar Decathlon, which has now connected and showcased individuals in Europe, the Americas, and Asia, all of whom are committed to building an energy sustainable future! I had the privilege to meet students and tour some of the houses today. I was amazed at how extremely bright and multi-talented these students are. The future of home design and residential efficiency can be seen at Solar Decathalon 2013. That really does look marvelous. What a great way to teach the future of today about the environment and more importantly protecting it for further generations. Bryan, Janet and James – Thanks for your comments and I’m happy you all share the same enthusiasm that I have for the Solar Decathlon! Amzaing Information. This is the great way to increase the energy efficiency. Install energy efficient windows and doors to increase the energy efficiency of your home. Double or triple glazed windows can increase home efficiency at a more affordable cost than a major home renovation. Weather strip doors to eliminate drafts and create an air seal. Solar Decathlon: The Energy Leaders of Tomorrow Are energy efficient houses and businesses worth more? The return on investment of being Green INFOGRAPHIC: How it Works, the Solar Decathlon Microgrid INFOGRAPHIC: What does it take to compete in the Solar Decathlon?